“Eighteen months ago, the only person who thought there was a chance I would play in the World Cup was me,” says Australian cricketer Brett Lee with a satisfied grin. The 34-year-old’s return to international cricket following a two year absence is remarkable, though less surprising considering his long history of resilience. Since Lee’s debut in the Australian squad almost 15 years ago, “Bing” has conquered career-threatening injuries affecting his back, elbow, ankle, abdominal muscles and ribs. In 2008, he bowled against South Africa with a broken foot. Thankfully, he’s just played three ODI matches against Bangladesh without so much as a scratch. “I think I’ve had 12 operations,” says the 1.82 metre blond, whose mere presence in the lobby of Dhaka’s Hotel Sonargaon creates enough excited whispering to drown out the piano. Even when he’s in peak form, the comeback king concedes that pain is a constant companion. In a former incarnation, Lee may have been a highly successful aerobics instructor. At any rate, his updated status as the world’s fastest bowler (following the retirement of Pakistan’s Shoaib Akhtar during the World Cup), and a solid World Cup performance should be enough to silence the cynics, at least for the time being. On the day before the interview, Lee played his 200th ODI match, the second milestone to be achieved in Bangladesh — in 2006 he made his 1,000th Test run. He has scores of other accolades, some more unusual than others: a greyhound named after the speedster earned Tk 1,174,686,932 (AUD$15 million) in stud fees. However despite retaining the top ranking for ODI matches, Lee’s national team has lost their gloss in recent times. Australia lost the Ashes again, failed to win its fourth consecutive World Cup and has slipped to fifth place in Test match rankings. How long does the Aussie stalwart believe it may take for his team to dominate international cricket once more? Although Bangladesh was given a whipping by Australia during the ODIs, Lee had some kind words to say about his opponents. Lee said the ODIs were “a lot of fun” and that the Australian team “always enjoys playing in front of crowds here.” However he added, “It’s always tough for us guys to play in the subcontinent because we aren’t really used to the zapping heat and humidity. The other day [in Dhaka] it was only 32 degrees, but as soon I walked outside I was perspiring a lot. I lost five litres of fluids a day.” The upside, possibly, is a suntan so golden it defies the hotel’s dimmed lighting. He looks healthy and relaxed. Lee was once described by an Indian journalist as “the most famous Australian in India,” and when I cite Shah Rukh Khan as one of his fans, Brett laughs and quips, “Oh really? I’m playing for his franchise, the Kolkata Knight Riders. I might ask for a few acting tips as well.” Lee should be plucky enough to ask for a role, as he has already made a cameo appearance in a Bollywood film (funnily enough, it’s called ‘Victory’ and it’s about cricket) and recorded a duet with Asha Bhosle that topped the Indian and South African charts. In November last year, his band “White Shoe Theory” performed six shows across India – “It’s always nice to break things up,” said Lee of the change in lifestyle. Lee is currently writing new songs and, for the record (pardon the pun), he is “potentially interested” in other Bollywood opportunities. Although Lee is by no means the only foreigner playing in the Indian Premier League, I wondered whether he ever encounters language difficulties on the field. “Most guys speak English, and do so very, very well. And I try my Hindi occasionally,” he adds. “You can speak Hindi?” I ask. 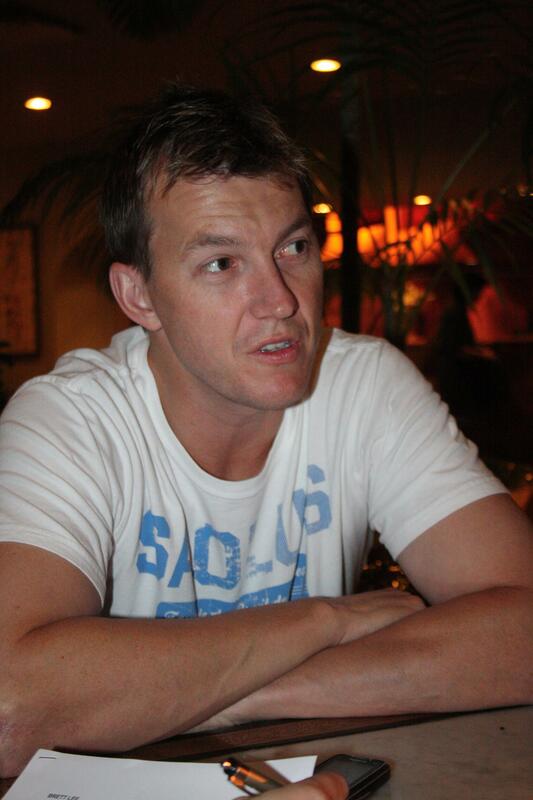 Lee said that the sporting culture in the Indian Premier League (IPL) differs from Australia, the latter of which has a strong association between beer and cricket (its national sponsor, Carlton and United Breweries, promised to give every Australian adult a free beer if its team won back the Ashes). However Lee avoids making generalisations on the subject. Lee’s first visit to India was back in 1994, when he toured with the Australian under-19s as a 17-year-old. After turning 18, Lee spent two weeks at MRF Pace Foundation in Chennai – and it now appears that the coaching tables are beginning to turn. 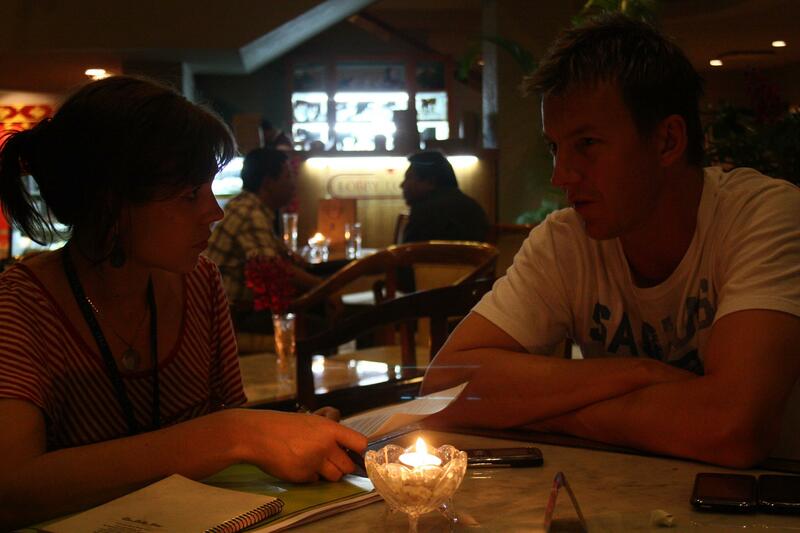 Lee said he will be “heavily involved” in an upcoming programme combining education and cricket in India. “It would be great if something could happen here in Dhaka also,” he said. 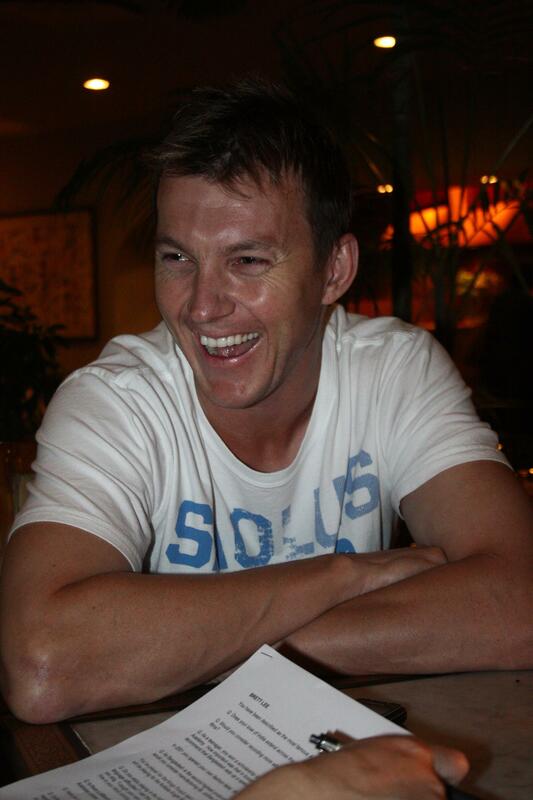 hi, one of binga’s fans shared this link on fb a while ago. am from Goa, India – a journo too and appreciative of what you do. But there is a rectification, I would like to make here – he toured India across six cities with his band, ‘White Shoe Theory’. The band you mentioned was of his boyhood days. The scan of my interview is on my FB – Basil Da Bullet & my You Tube Channel too. Will soon have it up on my blog.